In what could well be the last Antrim football final played at the Andersonstown venue before the stadium is totally rebuilt, it was fitting that the greatest Antrim club team of the past 30 years would once again collect the Padraig McNamee Cup. And perhaps it was also an encouraging signal to the future with the young Lámh Dhearg team making folly of their 15/2 pre-match odds by sticking with St Gall’s until the final whistle. No-one can say for certain that they will win an Antrim Championship in the years to come, but on the evidence of Saturday night there is no reason to doubt it. St Gall’s were below par, but could have had the game wrapped up in the opening half when first Karl Stewart and then Mickey Pollock wasted gilt-edged goal chances. Lámh Dhearg had some bad luck themselves in the opening half, none more so when experienced full back Kevin Murray hobbled off with a groin injury that he had been nursing all week, inside the first ten minutes. This caused a re-shuffle in the back line and it took some time for Lámh Dhearg to settle, and by that stage St Gall’s were 0-6 to 0-1 in front. Six different scorers were on target for the champions, and all scores came from play. Stewart really should have found the net after five minutes when he rounded John Finucane in the Lámh Dhearg goals, but shot over. Kevin Niblock’s sixth point after 15 minutes came after a Paddy Cunningham free for Lámh Dhearg had hit the upright, fell back into play and was gobbled up by Sean Kelly. This began a flowing counterattack with St Gall’s piling forward exchanging numerous hand passes and Niblock had the time and space to split the posts. But Lámh Dhearg refused to buckle and Stephen Tully powered a great point over the bar, before Ryan Murray twisted and turned past his marker and stroked over to make it 0-6 to 0-3. Again though St Gall’s wasted a great goal opportunity when Pollock was in on goal, but he sent the ball wide, albeit under pressure from the advancing Finucane. Minutes later Karl Stewart missed a free from close range and Pollock then opted to take a point when close to goal. Gerard Slane and Pollock exchanged points before Terry O’Neill was booked for a foul on Paddy Cunningham. Cunningham converted the free and O’Neill’s match was over as he was substituted almost immediately after the booking and replaced by Conor McGourty. In typical style, CJ boomed over a great score on the turn from all of 40 metres with his first touch. Two further Cunningham frees left the half time score St Gall’s 0-9, Lámh Dhearg 0-7. Hannahstown began the second half on the front foot. Brendan Herron sent an effort narrowly wide, and Cunningham reduced the gap to one point from another free when Conor Murray was fouled. Lámh Dhearg then hit two consecutive wides that, if converted, would have given them the lead, but St Gall’s are masters at punishing such profligacy. Kieran and CJ McGourty added a point each and for the final fifteen minutes the sides went score for score. The game became niggly, which suited the team in front. 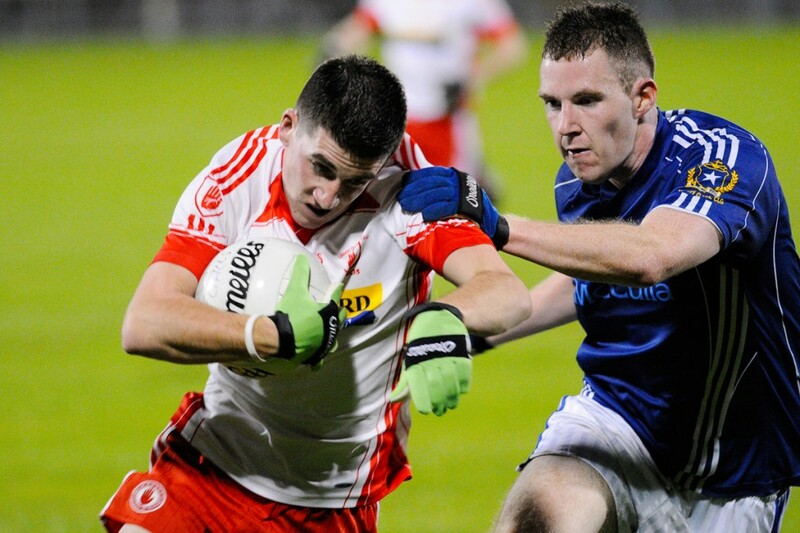 Michael Herron was booked for contesting a decision to award St Gall’s a sideline ball. Conor Murray also found himself in the book for a pull back on Aodhán Gallagher, whose powerful forward runs were continuing to trouble the Lámh Dhearg midfield. St Gall’s were also guilty of indescretions and conceded three frees, which Cunningham accepted with relish. However, a hat trick of points from the impressive Niblock kept three points between the sides. It was 0-14 to 0-11 with five minutes left and St Gal’s took the opportunity to display their ‘sevens’ skills, keeping the ball with a series of hand passes. Chris Tumelty, Brendan Bradley and Darren O’Hare were all thrown into the fray but all the substitutions achieved was to break the rhythm of the game, and that’s exactly what St Gall’s wanted. The final whistle sounded and St Gall’s could celebrate five in a row, and a tenth title in 11 years. Lámh Dhearg, with 12 of their Ulster winning minors in the panel, can look to the future with optimism. ST GALL’S: Ronan Gallagher; D Harbinson, C Brady, A Healy, S Kelly (0-1), A McClean, D Cummings, A Gallagher (0-1), S Burke; T O’Neill, Rory Gallagher (0-1), Kieran McGourty (0-1), K Stewart (0-1), K Niblock (0-4), M Pollock (0-3). Subs: CJ McGourty (0-2) for O’Neill (29), M Kelly for Healy (45), B Bradley for Rory Gallagher (54), P Veronica for McClean (58), D O’Hare for Pollock (61). LAMH DHEARG: J Finucane; C Nolan, C Murray, C Kelly, M Hynds, M Herron, B McCrudden, B Herron, C Murray, G Slane (0-1), D Lynch, B McCombe, P Cunningham (0-8, 8f), S Tully (0-1), R Murray (0-1). Subs: D Stranney for K Murray (8), K Quinn for McCrudden (43), C Tumelty for Stranney (54).